Traditional braces use a system of wires and brackets that are bonded to the teeth to shift them into their ideal position. Although traditional braces cosmetically impact your smile, they are considered the most cost-effective form of orthodontic treatment and extremely reliable. 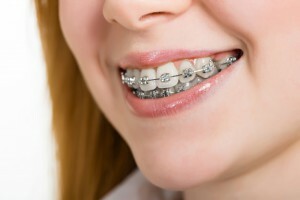 Traditional braces may offer the best cosmetic results for patients with severe orthodontic issues. For some patients, their primary goal is to align their front six teeth–the teeth that are most visible when you smile. To accomplish this, we offer short-term braces which align the front six teeth with no adjustment to the occlusion (bite). If this is your main goal in orthodontic treatment, and you want to have treatment completed in a short amount of time, our experienced orthodontists can evaluate your smile/occlusion and determine whether short-term braces will succeed for your needs. Please contact us to schedule a consultation and discuss your options with Dr. Hardy. 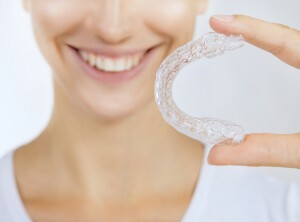 Invisalign® and ClearCorrect™ straighten teeth without the traditional metal brackets and wires impacting your smile. The clear, removable design of these aligners renders this orthodontic treatment virtually invisible to others. Using a system of progressive, custom-fit aligners, teeth are gently moved into their ideal position. This treatment method allows patients to eat, drink, and clean their teeth with ease. Patients have much more responsibility with this method, but also much more control over their treatment. Patients that are committed to wearing their aligners the prescribed amount of time each day are usually able to achieve their cosmetic goals within 12 months. During your consultation process, Dr. Hardy will help you decide which treatment will best meet your particular needs. Lingual braces are gaining in popularity among our professional and adult crowds because of the cosmetic advantage they present. Lingual (tongue-side) braces are bonded behind the teeth rather than in front so they are hidden when you talk and smile. Lingual braces can achieve the same effective result as traditional braces but with a nearly undetectable appearance during treatment. Athletes, musicians who play wind instruments, media professionals and patients who are not candidates for Invisalign®, but wish to attain more discreet orthodontic treatment, may prefer this option of care. At Belmar Orthodontics we want you to feel confident in your doctor, our treatment methods, and our treatment technology/tools. If you have more questions about the types of braces offered by Dr. Hardy, or if you would like to schedule a consultation to learn more about your options, please contact our office today at 303.225.9016.